Foreigners living and working in South Korea might have some difficulty finding out suitable residence or office. 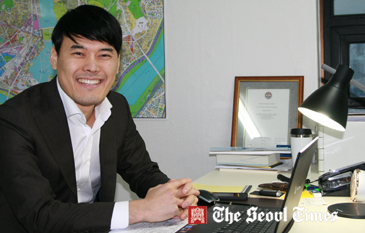 The Seoul Times has recently interviewed University of Edinburgh-educated local realtor, Peter Oh, to provide useful tips and advices for the foreign residents in the nation. 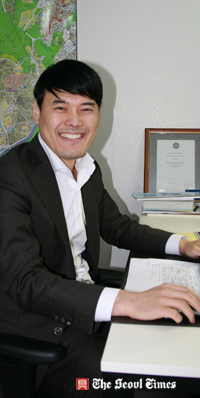 Peter Oh serves as president of Peter's Realty in Itaewon. The following is the full text of the interview. Q1: First, I would like thank you for this interview opportunity. I believe that there are more than 30,000 foreigners who live in Seoul alone. Many of them have trouble or difficulty finding their residence or offices. What do you think are their problems? How can you help them? South Korea has all types of high-rise housings due mainly to the high population density in a relatively small land space. I guess that I will and can be a great assistance to the foreigners seeking offices or housing, since I have enough experience of living and studying in such foreign countries as Japan, America, Great Britain, and China. Q2: Many of the local real estate agencies have trouble communicating with foreigners and they show some problems coming from the lack of professionalism and also lack of responsibilities. What advices you can give to the foreigners? A2: A number of real estate agents are actually working without a license. Unlicensed agents can cause you lots of trouble including financial losses. You should find first a reliable agent who will take care of you from start to finish. After-care is also very important in this area. Q3: What are your recommendations or advices for those seeking residence? A3: Location comes first. Accessibility to work and schools for kids is also something you should take into consideration. Single family houses, apartment houses, villas, and officetels are available depending upon their needs. There are three types of renting residence. They are depositing only huge key money, paying monthly payment, and the combination of paying partial key money and monthly rents. When you sing the contract you should sign it with the owner of the property if possible. President Peter Oh (left) of Peter's Realty in Seoul's Itaewon area poses with Trade Commissioner A Rashid Mohd Zain of Matrade (center), Malaysia’s national trade promotion agency in Seoul. It is always safe to send the money directly through the bank account of the landlord. You should meet with a realtor you can trust. For that you can ask your friends for the right realtor. Q4: Lots of foreign businesspeople are seeking office spaces and some of them face some difficulty. Will your comment on this please? A4: Commuting should be No. 1 factor in seeking offices. Subways and bus stops should also be taken into consideration. The areas near Jongno and Tehran Road in Gangnam are some of the most favored areas by the foreigners. Companies of the same or similar business are concentrated in the same area. Yoido area is well known for financial business and Kangnam is favored by various foreign companies, particularly by foreign-made car companies. Q5: Moving and relocation are also difficult issues for foreigners visiting Korea. How they can contact and choose local companies for this service? A5: You can first choose several companies and compare the prices and services they offer. For this you can visit such related sites as Seoul Global Center (www.global.seoul.go.kr) and the Real Estate page of The Seoul Times (www.theseoultimes.com). There is one thing you should remember. Never pay money in advance, but make payment only after all the services are done and only after you check all the things are alright. Q6: Is there any advice for foreigners when they buy or sell real estate properties? A6: Foreigners should also pay taxes when they sell or buy property. They should pay taxes within 60 days of the transactions. Otherwise they will be subject to penalty of between 5 and 30 percent of the sales amount. Reliable agents can be a great help in this case as well. All the related documents should be kept well to save taxes later in case you resell them. Q7: What kinds of services does Peter’s Realty offer to expatriates? What are your specialties and strengths as a realtor? A7: Peter’s Realty provides total relocation services which cover all the needs of expatriates from arrival to departure as well as real estate consulting. We pick up expatriates, offer temporary residence, guide for the tour, public transportation, foreign schools for their children, hospitals, restaurants, translation and interpretation services. When it comes to finding housing or office we find them location, and teach them how to negotiate about prices, how to redesign interiors, cleaning services, and how to calculate bills, delivery of newspapers and water, internet and cable hook-up service. Peter’s Realty can also offer any other services upon the request of the customers. Q8: How and when did you decide to involve yourself in real estate business? A8: I received a master’s degree in economics and finance from the University of Edinburgh in Great Britain two years ago. But even before that I worked at a local joint venture company with Morgan Stanley in Seoul. I took care of land transaction and was in charge of development projects for shopping centers and residential facilities. Before my departure for a study in Scotland I did some research here in Korea. But when I arrived in Edinburgh I was shocked by the totally different environments. Finding housing, internet and phone connections, opening bank accounts, public transit system were all big problems for me. I realized that even if I could get some information through the internet I really needed somebody to help me out there in Edinburgh for the above problems. I always think of the days I spend in Edinburgh and do not forget the difficulties I faced as a foreign student there. So, I decided to help the foreign visitors and expatriate residents here in Seoul as a realtor. Whatever needs they want and whatever services they want I will do my best to help them out. For details call 02-790-8334 for Mr. Peter Oh.